A charming book about real friendship, prejudices and curiosity. And a plea for more tolerance and courage. Lucy is anything but happy when her mother tells her that she can’t come with her to California and that she has to spend her holidays in Ireland with her aunt Paula. Lucy knows exactly what that means: five long weeks with nothing but rain and a women she doesn’t even know yet and who is said to be a little crazy…. But, as it often happens in life, things turn out differently than anticipated: Lucy is surprised of what a beautiful country Ireland is and has to admit that her aunt isn’t that crazy after all. At the end of the novel, the young girl has not only had the best vacation in her life, but also learned a lesson for life: Never judge people you don’t even know yet! Recommendation for teachers: In the publisher’s material for teachers recommended as an captivating novel. With humour and empathy the author describes how Lucy’s emotional world undergoes subtle changes as she feels more and more at home at her aunt’s place in Ireland, leaving behind a knitted patchwork throw inspired by the shapes and colours of the west Cork landscape. The author: Gesine Schulz started her professional life as librarian and managed, reorganized or advised different libraries. 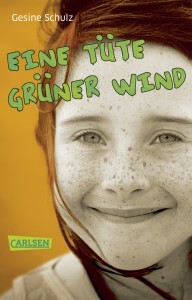 After spending several years abroad and working in Ireland, New York and Switzerland, the author returned to Germany and wrote her first children’s book, “The Green Wind”, which was published in 2002. Schulz is the author of three novels and a series of short detective stories for children.